The protein encoded by this gene is highly conserved in human, mouse, and chicken, showing 94% and 79% amino acid identity of human to mouse and chicken sequences, respectively. Hybridization to this gene was detected in spindle-shaped cells located along nerve fibers between the auditory ganglion and sensory epithelium. These cells accompany neurites at the habenula perforata, the opening through which neurites extend to innervate hair cells. This and the pattern of expression of this gene in chicken inner ear paralleled the histologic findings of acidophilic deposits, consistent with mucopolysaccharide ground substance, in temporal bones from DFNA9 (autosomal dominant nonsyndromic sensorineural deafness 9) patients. Mutations that cause DFNA9 have been reported in this gene. Alternative splicing results in multiple transcript variants encoding the same protein. Additional splice variants encoding distinct isoforms have been described but their biological validities have not been demonstrated. [provided by RefSeq]. 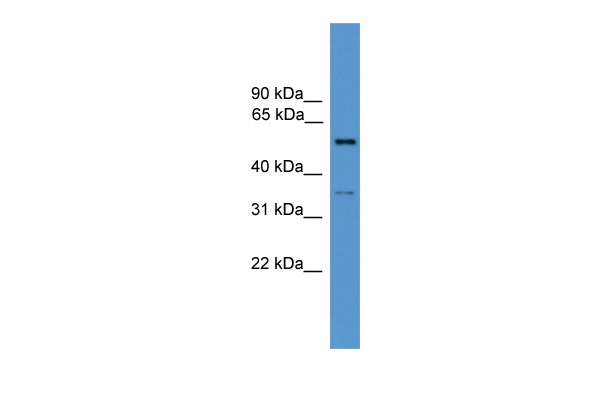 Western Blot analysis of COCH expression in transfected 293T cell line (H00001690-T02) by COCH MaxPab polyclonal antibody.Lane 1: COCH transfected lysate(54.34 KDa).Lane 2: Non-transfected lysate. COCH MaxPab polyclonal antibody. 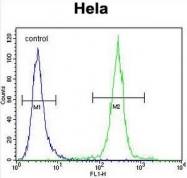 Western Blot analysis of COCH expression in HeLa. COCH Antibody (Center) (Cat. #AP51001PU-N)immunohistochemistry analysis in formalin fixed and paraffin embedded human skeletal muscle followed by peroxidase conjugation of the secondary antibody and DAB staining.This data demonstrates the use of COCH Antibody (Center) for immunohistochemistry. Clinical relevance has not been evaluated. Western blot analysis of COCH (arrow) using rabbit polyclonal COCH Antibody (Center) (Cat. #AP51001PU-N). 293 cell lysates (2 µg/lane) either nontransfected (Lane 1) or transiently transfected (Lane 2) with the COCH gene. 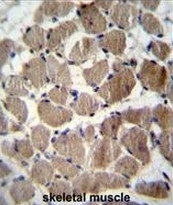 COCH Antibody (Center) (Cat. 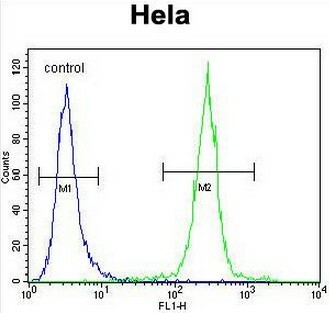 #AP51001PU-N) flow cytometric analysis of Hela cells (right histogram) compared to a negative control cell (left histogram).FITC-conjugated goat-anti-rabbit secondary antibodies were used for the analysis. Western blot analysis of COCH (arrow) using rabbit polyclonal COCH Antibody (C-term) (Cat. #AP51002PU-N). 293 cell lysates (2 µg/lane) either nontransfected (Lane 1) or transiently transfected (Lane 2) with the COCH gene. COCH Antibody (C-term) (Cat. 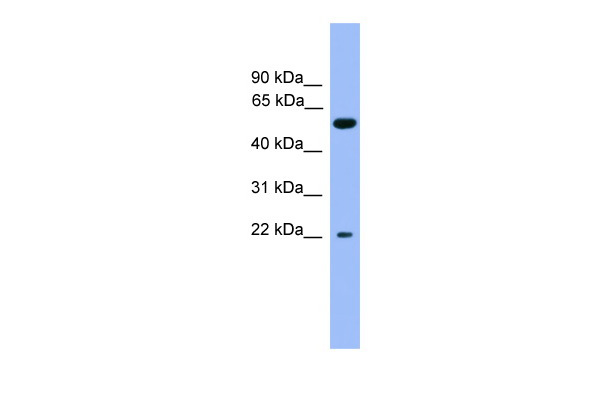 #AP51002PU-N) western blot analysis in 293 cell line lysates (35µg/lane).This demonstrates the COCH antibody detected the COCH protein (arrow).